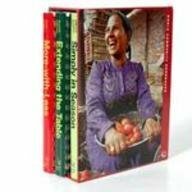 Three comb-bound cookbooks from the World Community, includes: More-with-Less - Recipes and suggestions by Mennonites on how to eat better and consumer less of the world's limited food resources. Extending the Table - Recipes and stories from Argentina to Zambia in the spirit of More-with-Less. Simply in Season - Recipes that celebrate fresh, local foods in the spirit of More-with-Less.